If you go into M. Night Shyamalan's "The Village" expecting a masterpiece of occult horror, you will be sorely disappointed. My teenage son was pissed off by the film. It was over his head. I understand his anger, as the advance PR promotes "The Village" as something it is not. I enjoyed the film very much. "The Village" is aimed at an adult audience. "The Village" concerns a hidden valley occupied by a utopian society circa 1895. The only drawbacks to this utopia are the monsters that live in the forest that surround the village. Until now, the creatures, or "those of who we do not speak" have stayed out of the village. When skinned puppies start showing up in the valley, the inhabitants begin to worry about the truce. "The Village" tackles issues that are important in light of the conflict in Iraq. The inhabitants of the village fear the robed creatures from the forest. If not for the impending threat, the village would be an ideal community. The Elders (William Hurt, Sigorney Weaver, Brendan Gleeson and others) are wise and caring. Their children are obedient and trusting. The only oddity in the village is the retarded Noah (Adrien Brody). All members of the village have the same goals and desires in life. Conflict comes when a young child dies of disease. 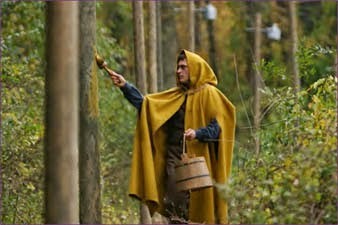 Lucius Hunt (Joaquin Phoenix) approaches the ruling counsel of Elders and requests permission to go through the forest to 'the towns' in order to bring back medicines that might prevent further loss of life. He is denied. The Elders protect their isolation. Monsters aside, they fear what would happen if outsiders discover their Garden of Eden. The village is very Eden like. No money changes hands. All needs are met. Love is the most important commodity. Ben Walker (William Hurt) is a widower with daughters. His oldest daughter loves Lucius, but that love is not returned. Ben's second youngest daughter Ivy (Bryce Dallas Howard) also loves Lucius. The no-nonsense Lucius does love Ivy. Also, Ivy is blind. "The Village" contains the most romantic scene ever put on film. Lucius and Ivy sit on a porch at night. Their simple conversation captures the essence of love. Shakespeare himself would be proud of the scene. The scene works as the central point of the film. The dangers and sacrifices of the film's second half stem from this heartfelt conversation. A number of people in the audience screamed out in distress when this love is challenged later in the movie. You will understand once you see the movie. Mr. Shyamalan continues to make films about spiritual seekers. "The Village" examines the price a people will pay to be free and safe. The film delivers a number of great frights. IMDB classifies the film as a horror/thriller/drama. It is more and less than that. "The Village" is a philosophy class. It is a deliberately paced essay on mankind's quest for utopia. The slow pace may disturb many ADD filmgoers. Shyamalan paces his film like the life of those in the village. Slow and steady, broken up by rare and terrifying diversions. Shyamalan is known for his twist endings. This film contains secrets. Older viewers will probably figure out some of the secrets long before they are revealed. I figured out the secret of 'the creatures' in the first 20 minutes. I figured out the secret of 'the village' about 20 minutes later. Knowing the secret didn't ruin the ride. I'm happy that M. Night Shyamalan is continuing to move in unexpected directions. He chose not to return to familiar ground and deliver a retread. This may upset some who want to relive the thrills of his previous outings. For me, "The Village" makes me want to see what Mr. Shyamalan has up his sleeve for next time.